Napoleon Bonaparte and Field Marshal Arthur Wellesley never met or corresponded, and they fought only one battle directly against each other, on June 18, 1815. The fact that it was the Battle of Waterloo, which resulted in Napoleon’s permanent removal from the French throne, cemented them together in history. 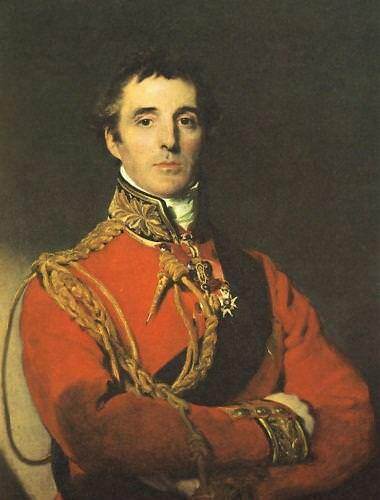 Arthur Wellesley – better known as the Duke of Wellington, a title he was granted in 1814 – was born in Dublin on May 1, 1769, the same year as Napoleon. He joined the British Army in 1787 and served in the Netherlands, India and Denmark before rising to prominence in the Peninsular War. He led the allied forces to victory against the French in Spain, and served as Britain’s ambassador to France after Napoleon’s first abdication in 1814. Louis XVIII was very fond of Wellington. The feeling was not entirely reciprocated. It is claimed that during the battle a British artillery officer came to Wellington to tell him that he had a clear a view of Napoleon and several guns pointing in that direction. Wellington replied, “No! I’ll not allow it. It is not the business of commanders to be firing upon one another.” (2) As Andrew Roberts notes in Napoleon and Wellington (2001), Napoleon needed to be defeated in the field. If he had been killed in an “ungentlemanly” fashion, people would always have suspected that he would have won the battle. Afterwards, Wellington refused to allow Napoleon to be handed over to the Prussians, who were keen to execute him. As Roberts points out, Wellington could not disparage Napoleon’s military skill without lessening his own achievements. Napoleon referred to Wellington as a representative of the “English oligarchy.” He blamed him for his exile to St. Helena, even though Wellington – who had spent a month on the island in 1805 – had nothing to do with the choice of that remote location. For more of Napoleon’s thoughts regarding the Battle of Waterloo, see my post on that subject. 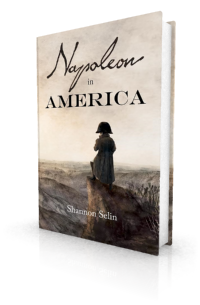 In his will Napoleon left 10,000 francs to a former imperial army soldier named Cantillon who had been accused, and acquitted, of attempting to assassinate Wellington in Paris in 1818. Although best known as a military commander, the Duke of Wellington was also a Tory politician. During the time in which Napoleon in America is set, Wellington was serving in Lord Liverpool’s cabinet as Master-General of the Ordnance. This meant he was responsible for British artillery, engineers, fortifications, military supplies, transport and field hospitals, among other things. He later served twice as Prime Minister of Great Britain, in 1828-1830 and again briefly in 1834. In his later years he was Commander-in-Chief of the British Army, a post he held until his death on September 14, 1852 at the age of 83. For an image of the Duke of Wellington on his deathbed, and to read his last words, see my post on the last words of famous people. Nor ever lost an English gun. For more about the Duke of Wellington, Adventures in Historyland has posted a fine Duke of Wellington reading list. Earl Philip Henry Stanhope, Notes of Conversations with the Duke of Wellington, 1831-1851 (London, 1889), p. 19. The Twelve Great Battles of England (London, 1861), p. 179. Another version of the story has the officer saying, “There’s Buonaparte, Sir. I think I can reach him, may I fire?” and Wellington responding, “No, no. Generals commanding armies have something else to do than to shoot at one another.” G.R. Gleig, The Life of Arthur Duke of Wellington (London, 1869), p. 267. Louis J. Jennings, ed., The Croker Papers: The Correspondence and Diaries of the Late Right Honourable John Wilson Croker, Vol. 2 (London, 1885), p. 286. Ibid., Vol. 3, p. 277.
found this through tweet from @PillarofState – excellent and informative, will be looking a lot more through this site in future. always interests me to understand what each thought of the other – not an easy subject to find accurate information on i would imagine. I think it still shows further that wellington showed some compassion for soldiers and on his enemies, interesting that he would not give Napoleon over to the Prussians after the battle. General —— has been here this day to negotiate for Napoleon’s passing to America, to which proposition I have answered, that I have no authority. The Prussians think the Jacobins wish to give him over to me, believing that I will save his life. —— wishes to kill him; but I have told him I shall remonstrate, and shall insist upon his being disposed of by common accord. I have likewise said that, as a private friend, I advised him to have nothing to do with so foul a transaction; and that he and I had acted too distinguished parts in these transactions to become executioners, and that I was determined that, if the sovereigns wished to put him to death, they should appoint an executioner, which should not be me. Thanks to Josh from Adventures in Historyland for providing me with this quote in the discussion about this post at the Napoleonic Wars Forum. Sadly, Wellington was never as good a PM as he was a General and is generally regarded as a failed politician. He actually had a technical advantage over the French, which is seldom noted. British artillery had a longer range and higher muzzle velocity than the French. Napoleon, being primarily an artillery officer could not compete against that advantage. The source of the technical advantage? A supply of Graphite, which allowed finer muzzle and ball surfaces. That technical advantage played a part in every battle on land and sea. Thanks, Bob. That’s very interesting about the British artillery and the graphite – thanks for pointing it out. Did Wellesley, during the wars, ever say something along the lines of, ‘where he (Napoleon) draws a line in the sand, there shall I step over it’? Thanks for the question, Tom. I haven’t been able to find any evidence that the Duke of Wellington ever said this, though the “line in the sand” has been attributed to several other historical figures – see http://en.wikipedia.org/wiki/Line_in_the_sand_(phrase). David Haworth’s book ‘A Near Run Thing’ title based on Wellington’s comment on battle. Napoleonic Code necessary in conception, unfortunate in details. Example — women’s property rights. Believe code framed by jurists who themselves had worked at law during ancien regime. Napoleon ordered the code. But did he have much to do with its concepts? Thanks for your comments, Douglas. Regarding the Napoleonic Code, there is an interesting article by Charles Sumner Lobingier in the Harvard Law Review of December 1918 (available for free on JSTOR: https://www.jstor.org/stable/1327640?seq=1#page_scan_tab_contents) that talks about how the code was drafted. According to Lobingier, Napoleon played more than a perfunctory role. A superb post – as usual! [I]t is very certain that I gave [Wellington] a terrible quarter of an hour [at Waterloo]. This usually constitutes a claim on noble minds; his was incapable of feeling it.